Peripheral arterial disease (PAD) is a condition in which arteries become narrow and reduce the blood flow to the limbs. It is a common circulatory problem seen in both men and women. Peripheral arterial disease is also called as peripheral vascular disease. Peripheral arterial disease generally causes leg pain and most of the patients experience difficulty in walking due to reduced blood flow. The arteries become narrow due to the accumulation of fatty deposits inside the arteries which can result in reduced blood flow. Peripheral arterial disease is generally associated with cardiovascular and cerebrovascular diseases. Managing peripheral arterial diseases in diabetic patients is difficult as it can increase the risk of chronic diseases. According to the research, peripheral arterial disease patients are asymptomatic instead of symptomatic. The most common symptoms of peripheral arterial diseases include: pain, cramping and aching of calves, thighs or buttocks. In few rare cases it can also lead to tissue loss and gangrene. 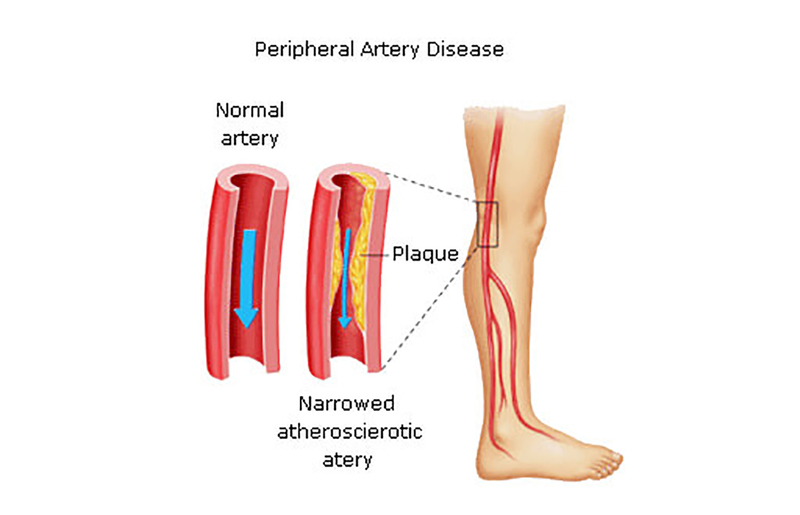 Peripheral arterial disease also increases the risk of myocardial infarction and stroke. In very rare cases it can also lead to death of an individual. Diabetic patients are generally asymptomatic while suffering with peripheral arterial disease. PAD in diabetes adversely affect the quality of life, thus contributing to long term disability and functional impairment of different organs. The common test done to diagnose peripheral arterial disease is ankle brachial index (ABI). This test helps in comparing the blood pressure in your ankle to the blood pressure in your arm. When the blood pressure is lower in lower part of your leg than in your arms, you are most likely to suffer with peripheral arterial disease (PAD). Peripheral arterial disease symptoms in diabetic patients can be controlled by diabetic foot treatment & diabetic foot surgery. Diet low in saturated and trans fats should be consumed to control the blood sugar and cholesterol levels in your body. Make changes in your lifestyle to manage diabetes as it can increase the risk of PAD. Medicines to prevent blood clots are generally prescribed by your doctors. In rare cases minimally invasive surgeries like angioplasty or stent placement is done to treat peripheral arterial disease. If you observe any symptoms of peripheral artery disease, then you can consult Dr. Abhilash Sandhyala for treatment. He is an efficient endovascular surgeon in Hyderabad known to treat peripheral arterial disease.